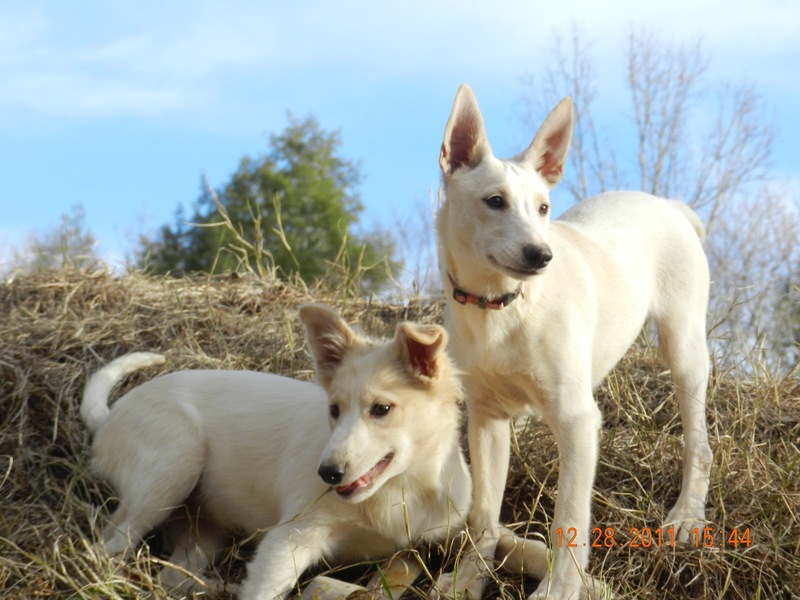 In reading over some articles on my Carolina Dog page ( http://www.mycarolinadog.com) I realized that being Healthy Wild is not a goal just for Carolina Dogs, but it should be for ALL dogs, all breeds. I am not meaning that one should toss the dog in the yard & throw it some hamburger meat every day, never take it to a vet, or teach it any obedience, or give it any love. Nor am I saying all dogs should run wild, unneutered, and uncared for. SINCE WE HAVE MADE “PETS” OF THEM, WE DO BEAR THE RESPONSIBILITY FOR THEIR CARE. Given the increase in pet diseases & ailments, all pet owners should be concerned with why this is happening and what we can do to reverse this trend…..
puppies first meal, raw green tripe! Dr Jordan and a few others are doing some wonderful work exposing this issue. This is another area where we need to change the paradigm of our thinking and living and raising our pets so they can be healthy, Nature’s Way.